Amnesty International has stripped Myanmar’s leader Aung San Suu Kyi of its most important award, accusing “The Lady” of perpetuating human-rights abuses. Amnesty accused Suu Kyi of not addressing the genocidal campaign conducted by Myanmar’s military against the Rohingya Muslim minority. Once a beacon worldwide in the fight for democracy, Suu Kyi has been stripped of a series of international honours over the Rohingya crisis. Amnesty International has stripped the former human-rights icon Aung San Suu Kyi of its most important award, accusing the Myanmar leader of perpetuating human rights abuses. Amnesty accused Suu Kyi of standing by and not condemning the violence and genocidal campaign conducted by the Myanmar security forces against the Rohingya Muslim minority. Amnesty International’s Secretary General Kumi Naidoo wrote to Aung San Suu Kyi to inform her the organisation is revoking the 2009 award. Eight years after her release from house arrest, Naidoo expressed Amnesty’s disappointment that she had not used her political and moral authority to safeguard human rights, justice or equality in Myanmar, citing her apparent indifference to atrocities committed by the Myanmar military and increasing intolerance of freedom of expression. Suu Kyi’s once iconic image as an upholder of human rights, and as a protector of her country has been decimated by the Rohingya crisis. The international human rights group named Suu Kyi as its 2009 Ambassador of Conscience Award recipient when she was still under house arrest as the de facto leader of opposition to Myanmar’s oppressive military junta led by the country’s powerful generals. In the eight years since she was released, Suu Kyi led her party to election victory in 2015 and set up a government the following year, but she has had to share power with generals and has no oversight and no appetite to rein in military forces. Borja Sanchez-Trillo/Getty ImagesAung San Suu Kyi greets Burmese immigrants at Talad Talay Thai Hall in Bangkok, Thailand. 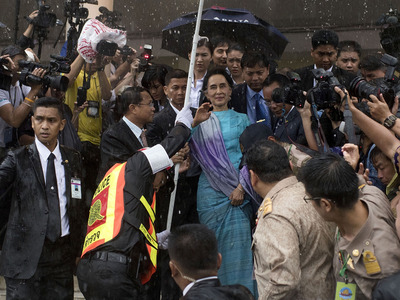 Myanmar’s Aung San Suu Kyi arrived in Thailand on Thursday, where she met immigrants from her country during the three-day official visit to Thailand. It was Suu Kyi’s highest profile overseas visit since her pro-democracy party took power in April, after nearly half a century of military rule. A United Nations report released in August shows how during a Myanmar “clearance operation” in September last year, soldiers shot and stabbed villagers, raped women, and burned homes while driving 6,000 ethnic Rohingya from their homes at Inn Din. Altogether it is thought more than 700,000 stateless Rohingya fled across Myanmar’s western border into Bangladesh after the Myanmar military launched a crackdown in response to a Rohingya insurgency targeting Myanmar security forces. Unsurprisingly, Suu Kyi’s administration rejected the findings and said the military was engaged in a legitimate counter-insurgency operation. Human-rights lawyer Chris Sidoti told Business Insider that placing pressure on Suu Kyi has no impact unless the generals are being isolated. Sidoti, currently a member of the United Nations Human Rights Council’s Independent International Fact Finding Mission on Myanmar and an adjunct professor at the Australian Catholic University said a binding council resolution passed in October was a far more effective tool to pressure the ultimate perpetrators of the persecution of the Rohingya. “The Myanmar generals are now under more pressure than they have ever been. They are fast running out of friends, running out of countries where they can feel safe from international justice,” Sidoti said. The International Court of Justice has also commenced an investigation heading towards prosecutions. “The generals face a future where, if they set foot in any country in the world, they could be arrested and charged and prosecuted for crimes under international law in local courts or be handed over to the International Criminal Court,” Sidoti said. The fact-finding mission has recommended sanctions on them both. The 50-year military junta – an effective dictatorship – has left the country economically ruined and politically infantile, with Suu Kyi presenting little more than an internationally acceptable face. “The country and its people have a future only if the military is transformed. That can only begin when all the top generals have been removed,” Sidoti said. Reuters reports that in March, the US Holocaust Memorial Museum withdrew its top award from Suu Kyi and she has been stripped of other significant honours, including the freedom of the cities of Dublin and Oxford, England, over the Rohingya crisis. Speaking at a business forum in Singapore ahead of the ASEAN regional summit, pleaded for international investment to return to Myanmar. She did not address the ongoing crisis which has driven hundreds of thousands of the Muslim minority into crumbling and dangerous camps on the border with Bangladesh and extinguished hopes of a brighter future for Myanmar. Amnesty International also accused Suu Kyi of not condemned military abuses in conflicts between the army and ethnic minority guerrillas in northern Myanmar and her government had imposed restrictions on access by humanitarian groups.